Evolution's most popular mitre saw in the range with its 230mm sliding rails. This 210mm sliding mitre saw is equipped to cut through, mild steel, aluminium, wood (even wood with embedded nails) and more with one TCT blade. Accurate cutting with laser guidance, adjustable depth of cut and 9 positive mitre stops. Reliable, smooth, square cutting every time in a variety of materials. Powerful 1500W hi-torque motor with optimised gearbox & blade system. Sliding functionality provides a 230 x 65mm cross cut capacity, allowing you to glide through materials with ease. Positive mitre stops both left & right at 0˚, 15, 22.5, 30, and 45˚. Ergonomic trigger handle designed for left and right handed use. Connect this with Evolution's Mitre Saw Stand, to give you the freedom to perform repeated length cutting on wide and long materials with precision. 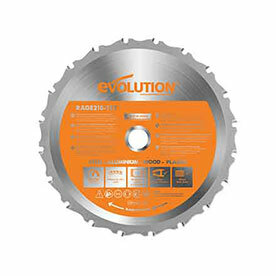 The Evolution 210mm Diamond blade can also be fitted for cutting ceramic tiles and ornamental stone, (sold separately). Japanese Tungsten-Carbide-Tipped (TCT) 210mm blade included. Evolution has re-invented the way to pack a mitre saw. Here is just a few reasons why Evolution “Flat-Packed” mitre saws are better. Compared to a fully assembled 210mm sliding mitre saw packaging, the box size has decreased by 40%. This makes it even easier to carry and fit in your car. More per container, per pallet, per delivery van. Less fuel consumption to deliver the same amount of products. Less carbon footprint, more environmentally friendly. 1. Insert rails through the neck. 2. Attach the head to the rails. 3. Fit the blade & attach extra fittings. Will it cut thicker than 6mm 1/4” mild steel plate? The arbor size of the R210SMS is 25.4mm. An Evolution dust bag can be fitted to this machine. However, click here to see More FAQs about Evolution Mitre Saws or, Contact our team of experts based in Sheffield, UK.